Every summer during my childhood my mom would pack up her daughters, and her best friend would pack up her two girls and we would hit the road for our annual “no boys allowed” beach vacation (they both have only daughters. No sons were left out). The moms we’re dubbed (and still to this day are called) “Beach Barbara” and “Beach Lynda”. We would stay at a condo for a week, eat all the fresh boiled shrimp we could, and play in the sand and surf from sun up to sun down. Of course, there were plenty of shenanigans going on as well. With 5 girls all within a few years of each other we reeked plenty of havoc and made a few too many boys cry. Though all the girls are grown and mostly married, and there are lots of grand-babies added to the mix, my mom and sisters still try to have our annual beach trip. Some years we’ve missed, and it’s been far too many years since I’ve sat on the beach with my mom’s bestie Lynda, but because of our yearly tradition I have very fond memories of the beach. My mother thinks that there are beaches in heaven. And she thinks her veins bleed salt water. She is happiest during our beach trips and if she could live among the seagulls and sand crabs I think she would. 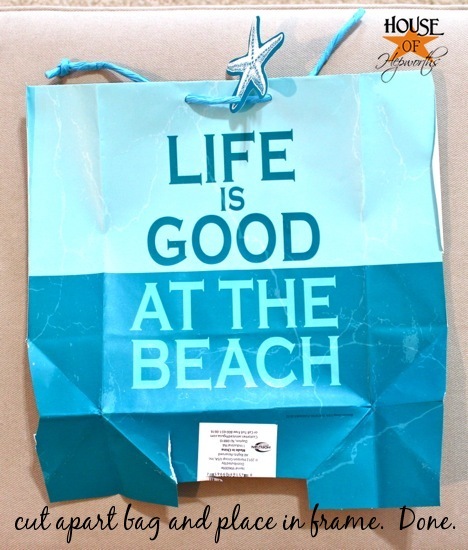 So when I saw this gift bag that read “Life is good at the beach” I just had to buy it for her. Of course, there really isn’t much you can do with a gift bag except maybe put a gift in it. But the coloring is pretty, and the letters are nice, and the overall look would be fabulous as art. This really is quite a simple tutorial. 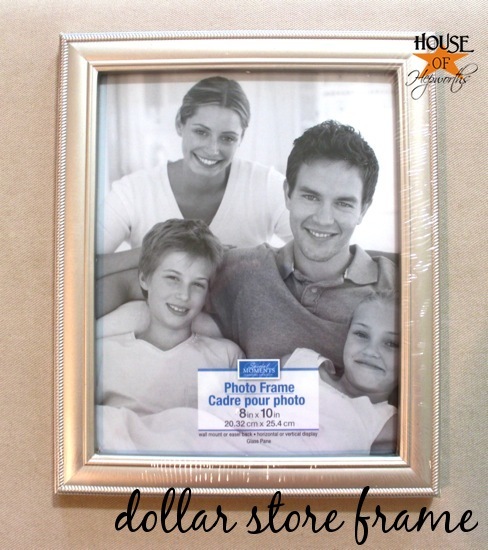 I headed over to the dollar store and bought an 8×10 dollar frame. 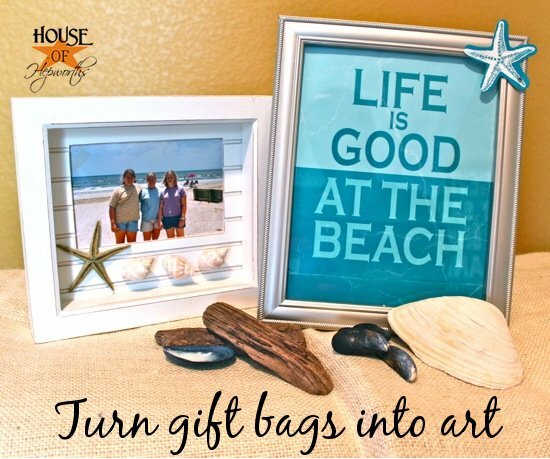 Make sure to get a frame that is roughly the same size as your gift bag. To frame the bag, cut it up one side and lay it out flat. Then just trace it around the glass in the frame and cut the bag to size. So easy. The frame with the girls in it I’ve had for years and years. 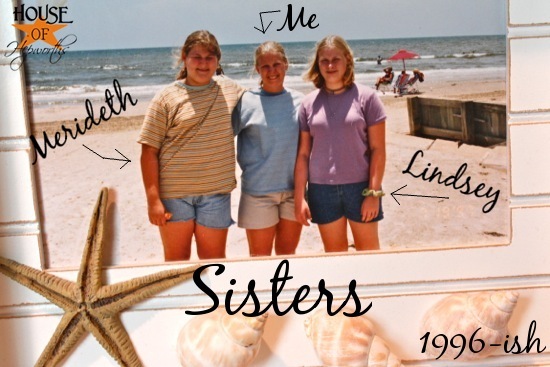 It’s a framed picture of me with two of my sisters during one of our beach vacations. I think it was taken in about 1996 when I was 16, Lindsey was 14, and Merideth was 12. Even after all these years the picture still makes me smile with fond memories. Here’s a pinterest-ready picture if you feel so inclined to pin it. Your friends that don’t read my blog (gasp!) will thank you for sharing this simple idea with them. Do you have any life-long traditions? I would really love to hear them! I love traditions and think they are so important. Spill your guts and tell us yours. 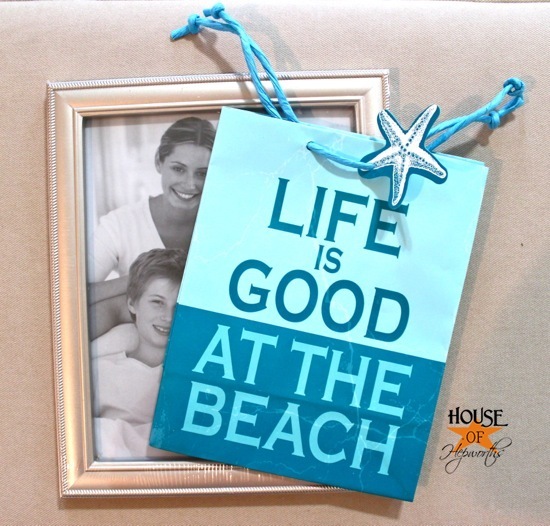 that is so simple but really cute, there are some really cute gift bags out there. Your beach story made me cry. My mom felt the very same way. Her 1st experience with the beach was in FL with her best friend right after high school. While growing up we didn’t take vacations, mostly due to finances & my dad’s job. One summer when I was married & my son & daughter were in grade school my husband had to go out of town for training for his job & it was when we had our Myrtle Beach vacation scheduled. I took my mom In my husband’s place so we could still go. She had the BEST time just sunning on the beach. I am so glad she had the chance to spend that time with us. My mom passed away in 1995 when my children were in high school. 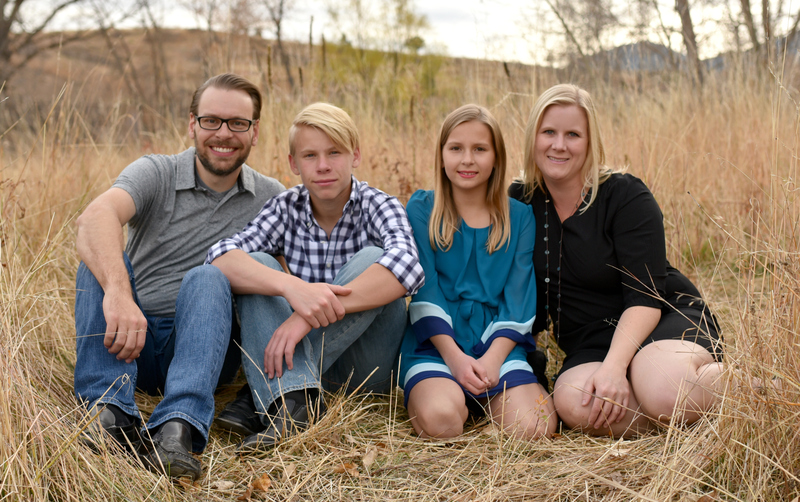 She was an only child whose dad died when she was 9. I have no sisters & I miss my mom so much. I wish we could go back to those each days! 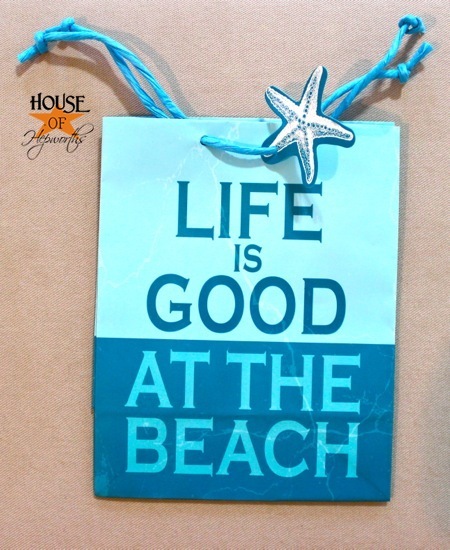 I am so happy you have those memories of your beach days! Thank you so much for sharing! Thanks for this! 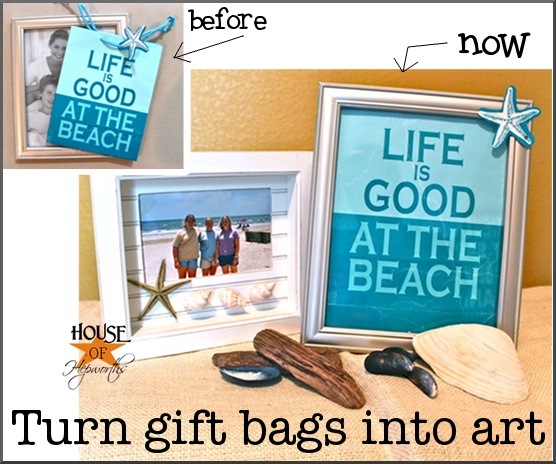 I have a closet overflowing with giftbags and this is a great way to use them, decorate and get them out of the closet. This would be so fun with a Christmas gift bag. Pinning this! I just love this idea!! Thanks for sharing, Allison!! This is such a great idea, love it!! Wow. That seems so easy after I read your post. Thanks! Well ain’t this super smart! LOVE! !